If you're interested in a career in photography, reading famous photographer biographies can give you inspiration. These biographies detail individual photographer's backgrounds, which usually includes their schooling, whom they may have worked with while learning their trade and how they made their break into the professional world of photography. While reading about famous photographers won't necessarily make you one, there are always tips you can learn from these professionals through their biographies. There are literally hundreds of famous photographer biographies available on online. Performing a search in your browser for "famous photographers" or simply searching for a particular photographer will give you dozens of links to choose from. The following is a sampling of some of the famous photographers you'll find online. Ansel Adams was born February 20, 1902. While his family was wealthy at the time of his birth, they fell into financial ruin during the Panic of 1907. Nevertheless, his parents and relatives endeavored to give him a proper Victorian upbringing in a conservative household. Ansel was considered intelligent, though he had trouble learning at the local schools. It is believed that he suffered from dyslexia. Because of this, he was home schooled and received a diploma from a private school, which was the equivalent of an eighth grade education. Ansel was a nature lover; this was reflected throughout his photos that he took once he became a photographer. He discovered the Yosemite and Sierra, Nevada and began taking photos with a Kodak No. 1 Box Brownie camera that his parents had given him. He joined the Sierra Club in 1919. By 1922, his photographs were appearing in the club's bulletin. Ansel began giving tours through the club and took pictures of the people and places that they visited. 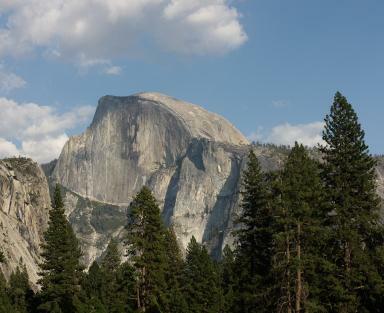 It was on one of these trips that he took his famous photograph: Monolith, the Face of Half Dome. He also met Mr. Albert M. Bender who was a supporter of the arts at this time and he assisted Ansel in preparing his first professional portfolio. He is best known for his black and white photographs. The rest, as they say, is history. Imogen Cunningham received her first camera in 1901 at the age of 18. While it held her interest for a short time, she quickly became bored and gave it away to a friend. It wasn't until 1906 when she was in college that she re-discovered using a camera. Inspired by the photographer Gertrude Kasebier, Imogen began photographing plants. Her chemistry professor was impressed by her work and she was enlisted to help photograph plants for the botany department. After graduating from college, Imogen went to work for Edward S. Curtis in his photography studio. Several years later she opened her own photography studio in Seattle. She became a much sought-after portrait photographer. In 1929, her photos garnered international attention when they were on display at the "Film und Foto" exhibition in Stuttgart. Vanity Fair publishers took note of her work at this time and was hired to work for them. She did so until Vanity Fair ceased publication in 1936. She continued to work as a photographer until her death in 1976 at the age of 93. Edward Henry Weston was one of the founding members of Group f/64. He was born on March 24, 1886. Edward received his first camera, a Kodak Bulls-eye #2 on his 16th birthday. In 1903, his photographs of Chicago and his aunt's farm were displayed at the Chicago Art Institute and he attended the College of Photography. Henry is well known for his f/64 photographs, which make a subject clear, both in the fore and background. His photos of shells and vegetables are well known, as are his studies of landscape. His sons produced a 50th anniversary portfolio of his work shortly before his death from Parkinson's disease in 1958. Henry died at the age of 71. If you'd like to learn more about famous photographers, one of the best places to search is the local library. Many biography sections have beautiful coffee table books just filled with photographs from your favorite photographers. In addition, they can be purchased from many bookstores, such as Barnes & Noble, Amazon.com, Waldenbooks and Borders. Get inspired today by reading one of these biographies. Perhaps the photographs you'll take today will be in a famous gallery tomorrow!